“Hi. My name is Craig and….I’m a rage quitter”. Released in 1995 as the third game in the Micro Machines series, MM 96 is a bells and whistles upgrade of Micro Machines 2, featuring new tracks and better graphics , whilst keeping hold of the frankly brilliant multiplayer using the two extra controller supports built into the frigging cartridge! Back in the day, Micro Machines was the undisputed multiplayer king, thanks in no small part to the fact that it was one of the first four player games for a home system that was actually a four player – not just 4 guys taking turns as prompted by a game. Is it still magic? Or, as they’re affectionately known on my copy, Elvis, Prude, Dipshit and Lunchbox. It’s a nippy little bugger! 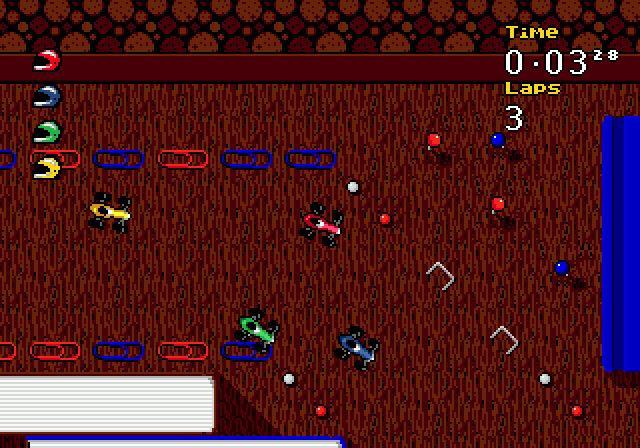 Micro Machines is a top down racer, set in school classrooms, kitchen tables, anywhere you ever got a bollocking for having your real Micro Machines. You race against 3 opponents and try not to get stuck in baked beans. Gosh that sounds great, doesn’t it? It genuinely is. The lack of sodding weapons allows for some serious competitive racing, whilst the top down view acts as both a blessing and a curse. See, the multiplayer is clever – rather than splitting the screen, everyone piles onto the big screen and, through the process of devious speed and trap based elimination, the last racer standing wins. The top down view means you can’t really see what’s coming up – and these little cars go like the bloody clappers – so unless you’ve learnt the layout of every track you can expect some fumbling. As you can imagine, in the multiplayer this is a laugh riot. And also as you can imagine, in the single player this is hideous. The speed and the view are both the games biggest flaws and biggest strengths, leading to some howlingly funny multiplayer antics, and some tv smashing, pad breaking, furniture flipping ragequits. After a few games you realise how frankly pissed off you’re getting, and from there it’s a bit of a downward spiral. The fact that in the single player your opponents are shown to be openly mocking you after you lose only adds to the.. *punches a hole in the wall*. It looks so peaceful doesn’t it? It won’t be after I’ve driven through those pushpins, slammed into the book, fallen off the side and put my fist through the TV. MAJOR bonus points go to MM 96 for having a track creation suite, full of everything you could possibly want to make a track that can destroy friendships at 10 paces. It really is a brilliant little tool, quick and easy to use, and adding surprising depth to a fairly straightforward racing game. It’s cute, cartoony, simple, and i want to punch all of the characters forever because they’re all smug and I hate them and it’s NOT MY FAULT THAT I LOST THIS IS BULLSH….*ahem*. The music is standard 16 bit fodder – memorable, but it’s questionable whether or not that’s a good thing. Look – MM 96 is great. It was a heap of fun alone or with friends back in 1995, and it’s still great fun now. Your appreciation for the medium will depend on how bad your temper is. If you’re completely unflappable, add about ten points to the score. As for me, I’ve got my one week ragequit chip, Dave’s concussion was never proven, and I’m taking it one step at a time. One step off THE F&*@ING TABLE, WHERE THE HELL DID THAT DRILL COME FROM, THERE WASN’T A TURN THERE BEFORE, THIS IS THE WORST GAME FUUUUUUUUUUUUUUUUUUUUUUUUUUUUUUUUUUUUUUUUU…..
Pros : Eye-buggingly fast in places, great variety of tracks, riotous multiplayer, excellent track creation suite, you can rename all the drivers so their names are swears. Cons : I think I’ve debased myself enough throughout the review, I’m not explaining myself again. I totally get what you mean with the pro/con style of this game. What makes it good also makes it bad. I remember the first time I saw the cartridge and thought “Thats awesome!” Unfortunately what I found was you had to have the controllers in before you switch it on otherwise the shaking sometimes caused the game to freeze. This would also happen when someone was getting way too excited and started unintentionally pulling on the controller because for some reason lifting the controller makes them turn faster!?!?!? Why did we do that? I didn’t have 3 friends in 96! I propose a BeerioMachines night! Is there a way to play this on any of the retro consoles? 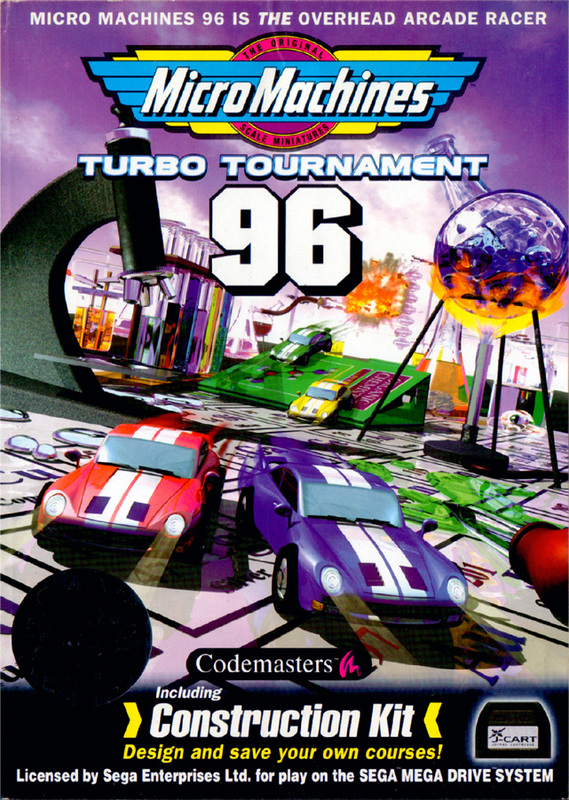 Micro Machines 96 was also called Micro Machines Turbo Tournament. It was available on Genesis and Super Nintendo aswell as the Game Gear and Gameboy.